Swarming season is truly underway. We have collected quite a number. The key to success is FEEDING. A newly developing colony needs a surplus of food to convert into beeswax and honey. If they have a continuous supply then the workers will feed the queen who will in turn increase her egg laying. So you get a faster, stronger developing colony who are able to draw out all your new foundation. 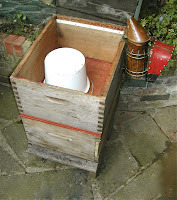 A simple feeder bucket can be used. Mix a solution of 1 kilo of CANE sugar only and 1 pint of water. Make up about 20 liters. If you don’t use it now, you’ll need it at the end of the season for their winter feed, around Aug-Sept. time. The sugar solution will keep for over a year. Mix until crystal clear. Invert the filled bucket over the holes in the crownboard. Careful not to drip! Wasps will smell it and you will point them to your swarm. They will kill your bees. Use an empty broodbox or super to hide your bucket. The roof will then fit neatly on top and be stable. Don’t just balance the roof on the bucket. The first good wind will blow it off. Also rain and insects will find their way inside. Feed your swarm until they have drawn out the foundation and have filled 70% of the frames with food stores. Then its time to remove the feeder and put your queen excluder on and supers. This I will show you shortly so watch this space!